Spring is in full swing during the month of May and the plants in flower are so numerous that it is difficult to choose which ones to mention here. You will see that the waysides and meadows hold a tremendous variety, pause to count how many species you can find in just one square metre! Note that there is a subtle difference between the flowering times in the sheltered valleys to that of the exposed higher pastures. 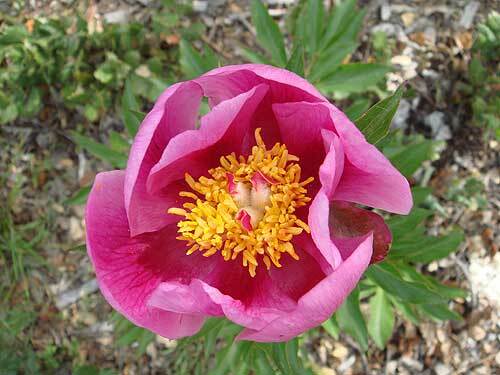 Look below the featured plants here, to see a condensed list to whet your appetite! (Grouped by colour). 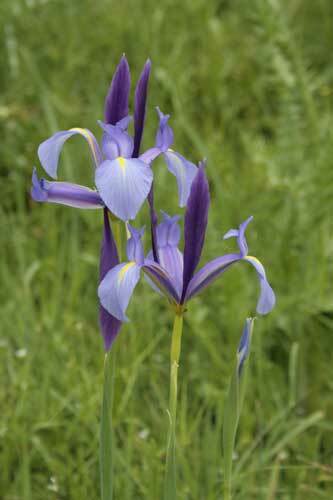 Spanish Iris (Iris xiphium) This is a tall and slender iris which has blue flowers with yellow areas on the falls (cascading petals).The three central petals (standards) are erect. 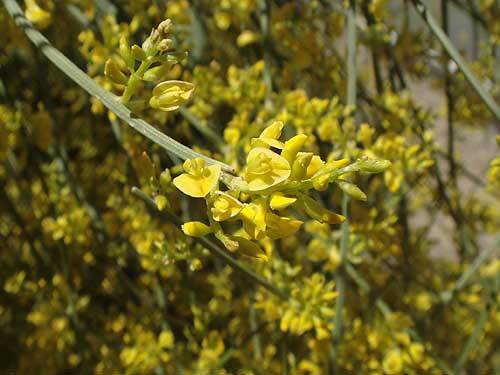 There can be one or two flowers on the same stem which remain open for several days. The leaves which sheath the flowering stem are grey/green, the lowest is long and tapering, the highest shorter and more upright. 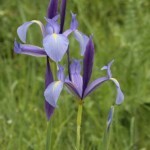 They can be seen in grassy or rocky areas, beside roads and field edges or in scrubland. Distribution: Iberia eastwards to Italy and NW Africa. 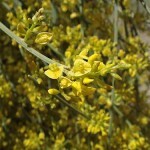 Perfumed, small yellow flowers cover this large (2 to 3metres) broom like shrub. When unchecked it can cover hillsides and pastures. There are very few leaves on the many fine branches, giving this upright plant a dense but wispy and silvery appearance. It prefers a dry habitat and forms good thickets for small bird and insect life. Flowering time is April to June. Distribution: Southern Spain, Portugal and North Africa. 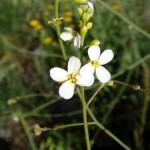 Each individual flower is made up of four tiny white petals, sparsely decorating the tips of the extremely fine, spindly stems – which can grow to around 1 metre. 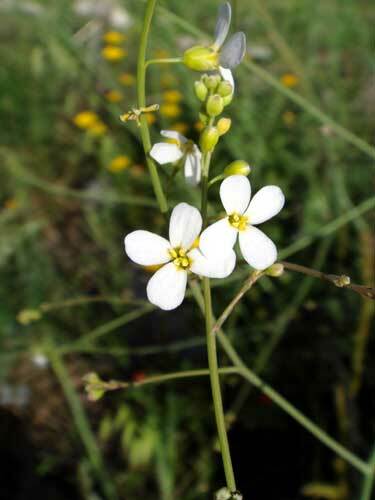 There can be several flowering stems from the basal rosette of leaves. Found in limestone areas at roadsides, on rocky slopes and in open scrub, flowering from April to June. Distribution: Southern Spain and North Africa. 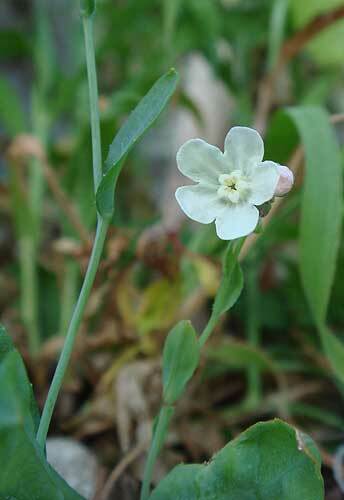 This is a small plant with pure white flowers (reminiscent of forget-me-nots) on finely branched stems. Broad, silvery blue leaves clasp the stem at the base. They can be found in groups in rocky crevices in the limestone mountain, flowering from April until June. Distribution: Southern Spain and North West Africa. 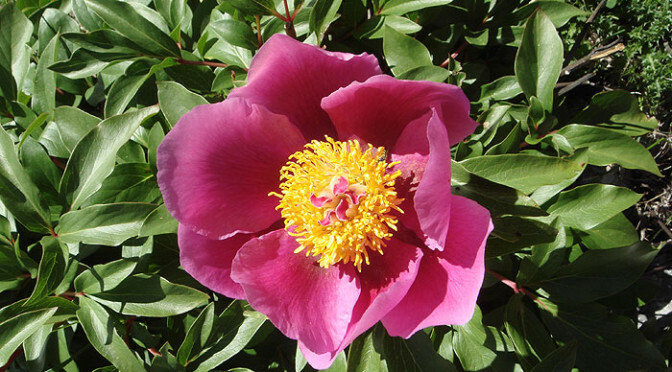 Incredibly showy, bright pink blooms worthy of a garden planting scheme. 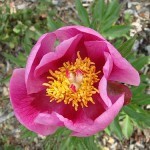 The rose-like pink flowers open to around 10cm with numerous yellow stamens adorning the centre. The attractive shiny green, cut leaves form a small bush to around 1 metre. Even the seed heads of this plant are of note, during the autumn they split to reveal pink and black seeds. Grows on open, or sparsely covered mountainsides and in light woodland, flowering from April to July depending on altitude. Distribution: Spain and Portugal. This medium sized shrubby plant, often around 1metre in height, is common in our area. 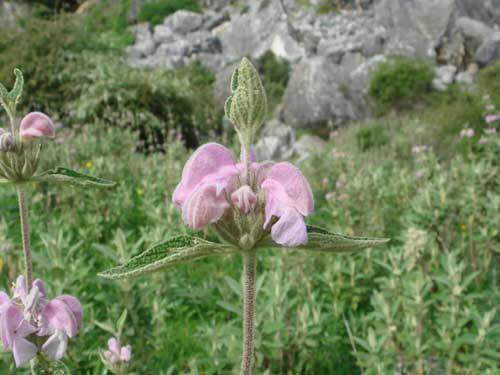 The flowers are more likely to be variants of pink, rather than purple which the name suggests. 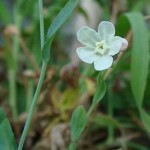 (Occasionally very pale, or white forms are seen). The flowers are in a circle or whorl clasping the stem, opening at different levels. Looking closely you will notice the individual flowers are hairy as are the stems and leaves. The underside of the leaf is covered in a white felt. 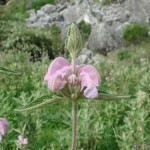 They flower from April to June on rocky slopes, scrubland, roadsides and field boundaries. Distribution: Central and Southern Spain, Southern Portugal. At Wildside Holidays – Grazalema we work only with local people who know every inch of this area and can offer you an authentic ‘Grazalema’ experience. We offer airport transfers, accommodation, knowledgeable local guides, the best Spanish cuisine and all the information you need to really explore and enjoy this amazing natural park in western Andalusia.